Weighing on the heart of youth motivational speaker and author Jeff Yalden is the issue of teen suicide. He has grieved with so many families over more than two decades, yet with each devastating loss, the heartache and pain – the very idea of trying to be a source of hope and comfort – only compounds the sobering realization that teen suicide epidemic continues to grow. He recently recalled visiting South Nodaway High School in Barnard, Mo., just weeks after 16-year-old Baylee Hilsabeck made the forever decision to end her own life. “The first thing you notice walking through a school this size in a community this small is that you are not walking into a school – you are walking into a home. This is family,” he said. The fact that there were only 84 kids in the building made it painfully obvious to Yalden how much a tragic loss like this could rock the students and the general community. He remembered coming in for a day of counseling, humbled by the privilege and opportunity to be a source of hope to the community. The problem is not going away. The fact that many teachers and counselors said that Baylee was probably the most popular junior in her class proves that suicide does not discriminate. Her grandfather also committed suicide, and the two were very close. Nobody will ever know what prompted her to take her life, but there is some speculation that part of this might have had to do with health issues. Yalden sat down with her mom and dad, read the suicide letter and saw Baylee’s bedroom. He also saw Baylee’s scrapbook at school, and helped her fellow students clean out her locker – a poignant moment, but one which gave these young people a sense of closure. Yalden’s takeaway from visiting Barnard was moving. To find out more about Jeff’s youth programs and suicide prevention workshops, click HERE. To order a copy of Jeff’s new book, BOOM! One Word to Instantly Inspire Action, Deliver Rewards, and Positively Affect Your Life Every Day, go HERE. Book Jeff now for your school, event or organization by calling 800-948-9289. The media has been abuzz about the controversial Netflix series, “13 Reasons Why,” based on a young adult novel of the same name by author Jay Asher – the jarring tale of high school student who takes her own life, leaving behind a handful of cassette tapes detailing her reasons for doing so and implicating others in her final decision. The series has put many schools, parents and other groups in panic mode, with some calling for the show’s immediate withdrawal from Netflix – a knee-jerk reaction in anticipation of a possible rash of copycat suicides. One such reaction came from Dr. Harold S. Koplewicz, president of the Child Mind Institute, in a recent interview with Savannah Guthrie on The Today Show. It should come as no surprise that youth motivational speaker Jeff Yalden’s email and social media accounts have been blowing up with requests for comments on the show. Yalden has spent 25 years in the trenches of teen mental health and suicide prevention. He has spoken to more than 4000 audiences in all 50 states, every province in Canada and 49 countries. Along the way, he has grieved with and counseled hundreds of families suffering from the losses of their beloved children and has presented suicide prevention workshops in communities across the country. This experience puts him in the unique position to offer a valuable perspective on this situation – one that has long weighed on his heart. “13 Reasons Why” might just be the wake-up call society needs to bring teen suicide into the light of day. “It’s alarming to a lot of people, because a lot of people don’t realize that kids are doing this every day. The bottom line is that parents need to be more invested in who their kids are, what their surroundings are, what they say and what they are doing,” he said. According to Yalden, kids are growing up much faster today for many reasons including the media, music, targeted marketing and social media, which potentially keeps them connected to the lifestyles and opinions of their peers for extended periods of time. Social media opens many kids up to the possibility of cyberbullying, a very definite factor in many teen suicides. “As a nation, I think we are in denial about how serious this is. If we don’t talk about it, we’re not going to be able to make a change,” he said, adding that we need to get comfortable about being uncomfortable about mental health and teen suicide in America today. Yalden sees youth mental health as an economic issue that needs to be addressed, and perhaps “13 Reasons Why” can be a catalyst for change. He has already heard from counselors and mental health professionals who say that kids are opening up about mental health and teen suicide as a result of the show. “Let’s remember that, ultimately – this is what we want to do. We want to get kids to ask for help – and because now kids are asking for help, we’re putting blame on this TV show, when the reality is that this TV show is bringing people to ask for help,” he said. I am a burden and a liability to other people. I have the desire for suicide. Put these symptoms together and you have a lethal or near-lethal attempt to take one’s life. The point is to make sure a child never feels alone or they are a burden to other people. Even though speaking up may be difficult in some cases, sometimes you must choose the difficult right over the easy wrong. This is a responsibility that everyone has. Ultimately, saying something can save a life. And “13 Reasons Why” is bringing a much-needed awareness to this heartbreaking situation. “A lot of schools are being forced to send out this emergency email to all of the parents because they are getting feedback from the community and parents that the kids have already watched the show,” Yalden said. From his perspective, the buzz is a good thing. Indeed, Yalden has been in the trenches of teen mental health and teen suicide for more than two decades. He has read too many letters and met with too many hurting families. He has removed guns from homes and has helped families, students and friends remove belongings from school lockers. “I might go against many people, but I think this is a great show. Of course, I see the cause for alarm, but I can also see the indirect situational and behavioral clues that we teach our young people to really look out for,” he said. Yalden wants middle schools and high schools to be required to watch and discuss this show in detail, with counselors and mental health professionals included in the discussion. “After all, our youth are the first line of defense in saving the lives of their peers,” he said. On Wednesday, March 22, Jeff Yalden brought his motivational and mental health expertise to Anoka Ramsey Community College in Cambridge, MN, where he spent a full day with the psychology club and the counseling department. Anoka Ramsey was a top-ten finalist for the 2017 Aspen Prize for Community College Excellence through the Aspen Institute, which is a nonpartisan organization dedicated to educational and policy studies. After breakfast, Yalden spoke with college staff about a message board out in the hallway which had been seen a spike in negative feedback about emotions. “The board usually inspires kids to come check it out, and they would post questions on it, but the school was becoming concerned about their mental health and mental awareness – so they decided to take action and brought me in,” he said. The first step was mindfulness training, which began with an exercise to chart anxiety levels on a scale from one to ten, with ten being the highest. “For us to be healthy, I think we should be operating between two and four,” he said, adding that celebrating little victories and small accomplishments is a good way step back and provide a needed mental break. He spent some time teaching a basic meditation practice of focusing only on breath – the inhale and the exhale – for two minutes. He went on to talk about his battles with mental health and depression and then shifted to mental health awareness and suicide prevention – how to look out for your friends and not being afraid to say something. “Somebody that isn’t mentally healthy is not thinking in the right frame of mind,” he said. Yalden stressed the importance of getting back “in purpose” after a setback or crisis. But sometimes the first and best thing a person can do is to ask for help. Two contributing factors to suicide can be dysthymia [a persistent mild depression] and adjustment disorder [usually following a stressful life event like a death of a loved one, moving, divorce, changing schools]. “If you have any of these for more than two weeks, go talk to somebody,” he said. “That’s an incredible discipline that you have to do every day. The problem is, you can’t just do it once in a while. You do it every single day and your whole life will change,” he said. To find out why Jeff Yalden is North America’s Number One Youth Motivational Speaker, visit www.jeffyalden.com. Book Jeff now for your next event by calling 800-948-9289. After he was already booked to speak at Lindenwood University in St. Charles, MO, North America’s Number One Youth Motivational Speaker Jeff Yalden got an email that there had been a student suicide on campus. “The young man was a sophomore and part of the men’s lacrosse team, and as you can imagine – this rattled the community and the school,” he said, adding that the athletic director asked Yalden if he could come in a day early to speak with the athletes, because they would be out of town competing on March 21, the day he was to speak. This would have involved changing his existing flights, resulting in additional fees that would be passed on to the school. “They said they didn’t have that in their budget, and this weighed on my heart. I told them I would come in on my dime and do it for free. I’d spend an extra day and then come back on the second night,” he said. Ultimately, the school decided to go a different route, and Yalden spoke on the day he was scheduled. 2) I am a burden and a liability to other people. 3) I have the desire for suicide. He talked about major depression, which is short but severe – causing young people to feel as if it will never end and prompt a suicide attempt. He mentioned dysthymia, which is a lower-level but constant depression that can also lead to suicide if left undiagnosed. “Suicide is the culmination of a lot of things, and one thing can be the straw that broke the camel’s back,” he said, and addressed the stigma attached to mental health. Yalden spent some time talking about cell phones and social media, and the effect these things are having on young people today, and said video will soon overtake all other types of content by 2020. Indeed, a recent Cisco study predicted that video will account for 75 percent of web traffic by 2020 [Source: Tubularinsights.com]. “That tells us that if young people are having trouble with social media today, it’s only going to get worse,” he said. Other hot topics that night were boundaries and balance. “I talked a bit about mental health, asking for help, learning how to put priorities and boundaries into their lives – learning to say know and learning to close their circle. It was a well-rounded program. 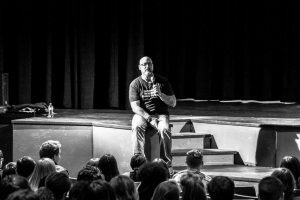 To find out more about Jeff Yalden’s impactful speaking programs, visit www.jeffyalden.com. Jeff’s schedule fills up fast. To book him now for your event or school, call 800-948-9289. What if we knew we could have prevented a friend’s suicide but didn’t do or say anything? 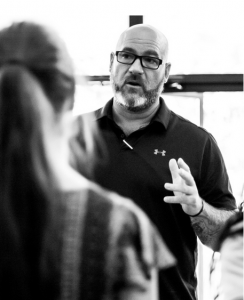 Meet Jeff Yalden – Teen Suicide Prevention Crisis Intervention Expert. This video shows Jeff in a community that had 12 teen suicides in one year, including four in six weeks. Jeff is today’s leading authority on suicide prevention and teen mental health awareness. 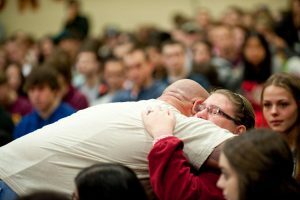 That heartbreaking question is one that has been weighing on the heart of teen motivational speaker Jeff Yalden after the suicide of Lincoln High School senior Quai Horton in Des Moines, Iowa on February 7, just a week after Jeff spoke at the school. Another question can be asked in tandem with the first one. What is the cost of losing a teenager to suicide? As far as Jeff is concerned, the true cost can’t be measured – and tragedies like these tend to have a ripple effect, sending waves of despair, anger, grief and helplessness farther afield than anybody can imagine at the time. But Yalden has long been a proponent of living in the now, and clearly now is all we have. “Be proactive today and do what you can to prevent a suicide from happening, or you will end up reacting and wishing you had done something,” he said. Obviously, this is easier said than done – especially if a person takes their life without any warning or without any signs pointing to his or her intentions. “Many people who commit suicide do so without letting on they are thinking about it or planning it,” said Dr. Michael Miller, assistant professor of psychiatry at Harvard Medical School in a 2012 Harvard Health Blog article by Patrick J. Skerrett, former Executive Editor of Harvard Health. For teens, suicide is right behind accidents/unintentional injuries and homicides, according to the Centers for Disease Control and Prevention, or CDC. But most people will at least drop a clue. For teens, social media is often the preferred platform for this pain. But make no mistake. Somebody saw these clues. Shortly after Jeff posted a video to YouTube about Horton and how sorry he was about the tragedy, the comments started to come in. One person told Yalden to kill himself. Another said he knew Quai was hurting and told adults about it. The veracity of the latter cannot be proven because yet another individual alluded that this was not the case. “We got help for the kid who told me to kill myself,” Yalden said. We will likely never know if anybody really stepped up, but the takeaway here is that at least a handful of Horton’s fellow students knew that he was in a bad place. But if anything, Yalden doesn’t believe anybody went far enough to bring any of this to light. “Your friend is hurting. You are 15 or 16 years old and you might call your friend every day, but you cannot break through the struggles that people are feeling mentally and emotionally. You don’t know how. An assessment needs to be done to find out if we need to treat this person. It’s really as simple as that,” he said. An administrator at Lincoln High School told Yalden recently that Horton would sit alone every day at lunch – and he would usually go up to him to see how he was doing. “Quai was a quiet dude, and there is nothing really wrong with sitting alone, but where sitting alone raises a red flag is that we don’t know the child’s mental state,” Yalden said, adding that sometimes a student might sit alone because they might simply be having a bad day or getting ready for an exam. Yalden believes that mental health is something that is not just a family issue anymore. He also recommends that all middle schools and high schools do suicide prevention in-service training once a year for students, teachers and administrators. For more information about North America’s top teen motivational speaker Jeff Yalden, visit www.jeffyalden.com. To book Jeff for your school, organization of event now, call 800-948-9289. On February 7, 2017 – not even a week after Jeff spoke at Lincoln High School in Des Moines, Iowa – he got the news that high school senior Quai Horton had taken his life. “I have a picture of him about five feet away from where I was speaking,” he said, adding that he also conducted an in-service training for teachers at the high school about mental health and teen suicide. “I want to offer my prayers, thoughts and condolences to all of the classmates, students, staff members and teachers – the Des Moines community – and most of all to the parents and close friends of our friend, ‘Q,” he said in a video message about Horton. What Yalden found the most disturbing about this young man’s suicide was that there were very direct verbal clues on his Facebook page indicating his intentions – and yet nobody said a word about it. “I want to tell you something: I spent some time on Q’s Facebook page – and from January 26 to Monday [February 6] – what breaks my heart are that the signs were very direct and very clear,” he said. There was more than a week for someone to come forward, and yet nobody said anything. 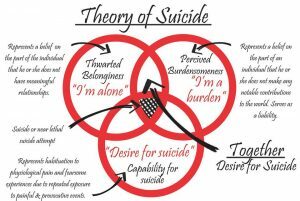 Because there is a concern about “copycat suicides” – it is of utmost importance for the community to remain vigilant for the telltale signs. They feel like they are alone. They feel like they’re are a burden to someone. They have a desire for suicide. If you feel alone, do not underestimate the value of a confidante. “Everybody has confidants in life. If you grow up and you have three people that you trust and respect – and whose opinions you value, then you are a very successful person,” he said. Is your life meaningful? Is your life fulfilling? Is your life rewarding? One of Jeff’s favorite maxims is – Take time to think. The pain of the loss of Quai Horton crosses generational lines. A simple “hello” while walking through the halls can make a big difference to somebody. For teachers, Jeff stressed the importance of acknowledging each and every child that walks into the classroom. Jeff closed his emotional video message by letting everyone know how sorry he was for the tragic news.